Have you ever been out walking on a dark night and suddenly found your face enveloped in a spider web? It’s one of the less pleasant sensations there is. Even if you’re the type who can sit through the scariest horror movie or walk through the spookiest haunted house without batting an eye, when you take an unexpected web to the face you’re bound to let out at least a little gasp, if not an outright shriek. It’s just one of the facts of life. Of course, a big part of the reason spider webs are so effective is that they’re hard to see even in broad daylight, let alone on a pitch black night. Spinning practically invisible webbing is a spider’s bread and butter. If the webs were, say, neon pink or covered in blinking lights, our summer evenings would probably be a lot buggier than they already are. So while this gigantic (16 feet long and covering 200 square feet! 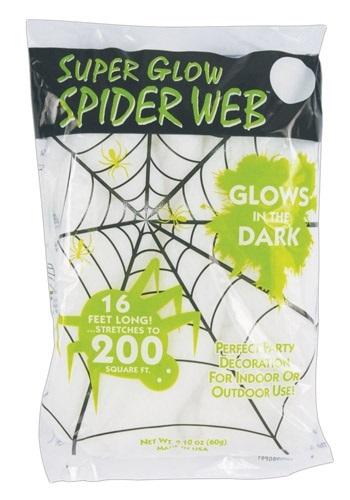 ), glow-in-the dark web is ideal for decorating the front stoop for trick-or-treaters or the living room for a costume party, we’re glad it’s not the standard for genuine spiders. On the other hand, a web you can see in the dark would be a lot tougher to plant your face in in the middle of the night.